The generous and innovative design is still relevant and it has retained the social principles that it was built for. Although it is tired in places, there is strong management and a commitment to contemporary improvements that respect its original design. The strong contributing effect of the vibrant surrounding context on this place underpins its specific qualities, ensuring the prospect of long-term viability and success. The well-designed, spacious and well-maintained public realm has created a safe, community friendly and well-used place. A stable and strong community is needed to take responsibility for a neighbourhood and, in this case, it appears that the current mix of 50 per cent social rented and 50 per cent private ownership works. Forward looking and flexible management coupled with active and committed residents has created a great place to live, work and play. The flats that face onto each other foster the feeling of community because the design means that residents can interact, create a sense of space together and bond with access to fresh air rather than the soulless corridors that are typical of much modern housing and which create no sense of community. The Grade II* listing of the estate has helped make the decisions on improvements more focussed and precise. It has ensured that its original character has been retained and this has sustained the local pride in the estate and the strength of the community. Golden Lane was developed in the early 1950s to create local housing for essential workers in the City of London, following the devastation of the Blitz. At the time only around 500 people actually lived in the City of London so the estate was deliberately designed with small units to house single people and couples comprised of the broad social and professional mix needed to support the local community. 554 units were built of which 359 were studios and one bedroomed flats; the remainder were maisonettes and early tenants included caretakers, clergymen, doctors, police offices, cleaners and secretaries. 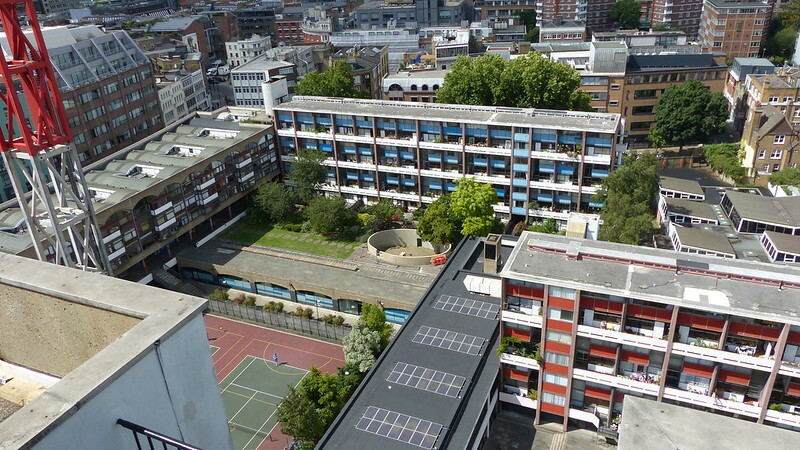 Today there are approximately 1,500 people living on the estate in 559 flats and maisonettes. Golden Lane was commissioned from architects Chamberlin, Powell and Bon by the City of London Corporation (which still manages it) and built on bombed sites previously occupied by small businesses and industries. Some of the basement areas of the former buildings were retained as sunken areas of landscaping. Building took place over a 10-year period between 1952 and 1962 when Crescent House on Goswell Road was completed. Golden Lane was listed Grade II in 1997 (Crescent House is Grade II*). When built, Great Arthur House was the tallest residential building in London and its Le Corbusier inspired design included a resident’s roof garden. The estate also included a leisure centre with a swimming pool and tennis courts. It is now run by a private operator and is open to both residents and the general public. When Golden Lane was built it was considered a model of social integration. Following ‘right to buy’ in the 1980s, the tenure and social mix of the estate has changed. Currently the tenure is about 50/50 private ownership and social housing but there is still a viable social mix and the whole estate appears tenure ‘blind’. Younger people, many working in local creative and media industries, who want to live in a design classic are buying some of the private property. They are also using their creative skills to support activities on the estate. There is evidence of a sense of pride in the design of the estate and it is undergoing a comprehensive refurbishment that follows the original design concepts but with an upgrade on materials to improve soundproofing and heat retention. This is being carried out in full consultation with and co-operation from affected residents. At Great Arthur House, for example, through a clever system of temporary internal walls, the original outer curtain walling and cladding is being replaced without decanting any occupiers, . Another example of resident involvement is that some, called the Golden Baggers, have raised funding and developed their own garden for produce and flowers in a disused storage space. There is a Golden Lane website, developed by residents, which is a forum for consultation and debate about the estate and the estate management is supportive of resident initiatives. The design of Golden Lane is inward looking, creating a safe and attractive environment for residents but it is not walled or gated and has a direct relationship with the surrounding wider neighbourhood and, thus, the rest of the City and London as a whole. There is a strong sense of place on the estate because of the consistency of design and management and this is expressed in the way that residents use the public realm and the areas outside their homes with planting in pots and informal sitting areas. The estate is and feels secure with very little antisocial behavior and low levels of graffiti and rubbish. The very generous public areas are good for social interaction and it is positive that the underused community hall, managed by the Estate Management, is also due for refurbishment. There is a good and thriving range of local shops beneath Crescent House facing onto Goswell Road and, of course, the estate is also close to the Barbican Arts Centre with world-class culture and entertainment. Golden Lane is very well connected to Transport for London and national train services and will soon benefit from the Crossrail hub at Farringdon station, which, over time, will make it even more attractive to private owners, possibly affecting the balance of the community. The strength of Golden Lane as a neighbourhood lies in its unique qualities, its proud and diverse community and its secure and safe environment. Strong and flexible estate management from the City of London Corporation supports all of this and its skills are exemplified by the creative approach to the refurbishment, which is taking place without needing to overly disturb or decant residents. It also ensures that common and landscaped and public areas are kept in good (but not too pristine) condition and are well used. There are a number of learning points from Golden Lane that could benefit similar estates around the country. Like Byker, it has benefitted from a strong and flexible management, but it has other advantages such as location and the wealth and creativity of private residents. Therefore, on balance we feel that Byker has made greater progress against tougher odds and is a better candidate for Great Neighbourhood, with Golden Lane a close second.